Jenna Efrein holds apple snails she created out of recycled glass. In the background is a mylar-and-glass installation representing Lake Okeechobee and its estuaries. Artist Jenna Efrein loves the Everglades. Since moving to South Florida, she's spent a lot of time exploring the ecosystem and learning about the challenges it faces. That passion -- and 10 years of gymnastics experience -- have shaped an installation of her work on display now at the Wynwood Building. The installation "We are HERE" highlights the Everglades and its imperiled water supply. Using recycled materials, including glass from hundreds of old beer, wine and liquor bottles, Efrein created a way for visitors to experience the Everglades' beauty -- and to see some of the problems the ecosystem faces. A marsh rabbit Eifren created out of glass from old beer bottles. Carefully crafted marsh rabbits are trapped in the clear glass bellies of pythons. Sea turtles stagger toward the lights of a car parked inland instead of following the moonlight into the sea. Alligators -- close to life-size and made of old Hammer and Sickle vodka bottles -- are choked under blue-green algae. "I like to use this platform to offer people the opportunity to create change," Efrein said. "It's a way for me to pass it on. Pay it forward." She encourages visitors to sit on benches she's built, taking in the art and reflecting on the challenges the ecosystem faces. Efrein holds a fish she created out of an old bottle. The installation is in the University of Miami gallery at the Wynwood Building, 2750 NW Third Ave., Miami. 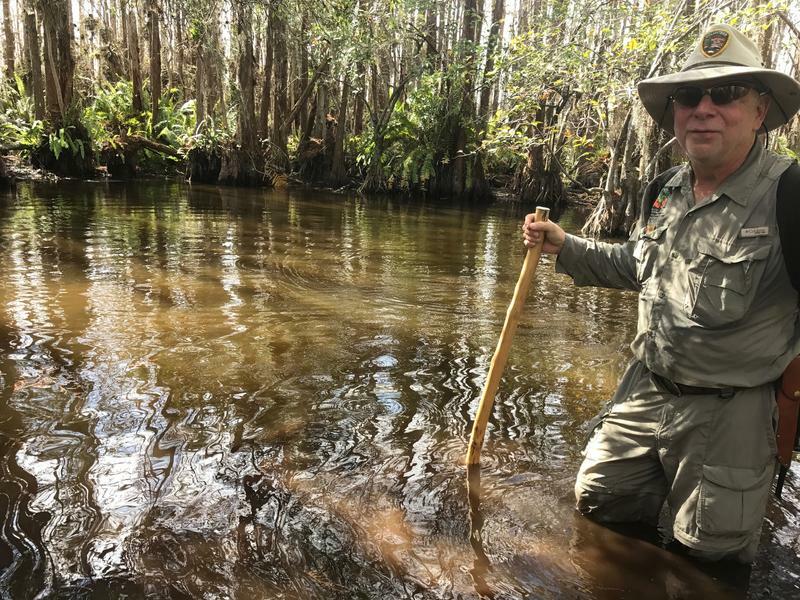 On Thursday, Efrein is hosting an educational panel at 7 p.m. Attendees will hear from scientists and activists about issues the Everglades faces. And Efrein says she’s asked each panelist to suggest one thing audience members can do to help preserve the Everglades. Regular hours are 10 a.m. to 6 p.m. Wednesday, Thursday and Friday. Everglades 101: Just How Does This Thing Work, Anyway? If you scoop a glassful of water from the heart of the Everglades, that water is as pure and clear as the water that flows from your tap. That’s because chances are good your tap water comes from the Everglades. One in three Floridians -- more than eight million of us -- gets drinking water from the Biscayne Aquifer a few feet below the southeastern Everglades. The ecosystem acts as a natural filter, removing excess nutrients and keeping out seawater. 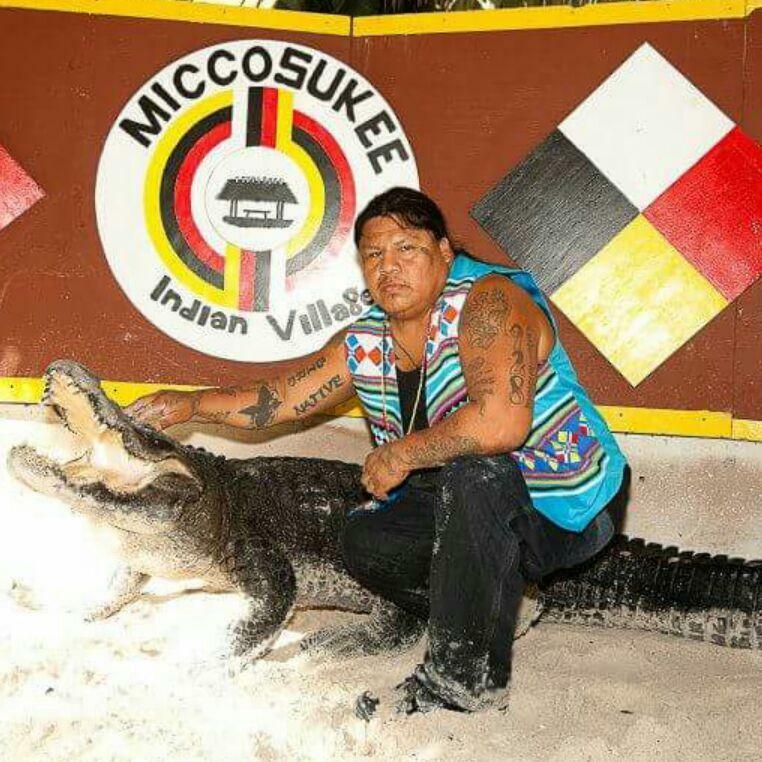 Rocky Jim Jr. has been an alligator wrestler for over 31 years. He learned from his father, Rocky Jim Sr., and comes from a family of alligator wrestlers: his grandfather, Bobby Tiger and his uncles, Bo Jim and Elvis “Tippy” Cypress. Rocky dropped out of school when he was in the 6th grade and began working maintenance jobs with his father. He later worked in his brother’s workshop, and eventually began working as a handyman at the reservation. One of the most biologically diverse places on Earth, from sawgrass to cypress trees, apple snails to alligators. The historic home of Florida’s Miccosukee and Seminole tribes. A national park. The ecosystem that ensures fresh drinking water for more than 8 million Floridians. Everglades advocate Marjory Stoneman Douglas talked about all this in an interview in 1983. The lingering nature of water through the Everglades has been matched by the slow progress toward the massive goal of reviving the region with more water and cleaner water. It’s been 17 years since President Bill Clinton signed into law the bill that included the Comprehensive Everglades Restoration Plan. That began the modern day effort to restore the Everglades after a century of draining and redirecting the water to create today’s South Florida. More than half way through the expected time frame for the work only a half dozen projects are underway.